Experience more freedom and confidence as yo become your true self. Learn how to take control of your life and achieve your goals more quickly, more easily and with greater results! It's time to live life your way! It is so easy to get caught up in the busyness of life. To be out of balance. To not give priority to what truly matters to you. If we don't consciously choose how we spend the precious time of our life, we lose it - to mundane tasks or to meeting other people's expectations. Our own dreams - the dreams that bring meaning to our lives - never see the light of day. And it starts with some basic commitment and discipline to create a plan and goals, and track and achieve them! The first plan being KNOW thyself. We want to support you in making your life your own. We want to see you living your highest potential. Here, at www.higherawareness.com, we've been helping people regain and harness self control and self wisdom since 1999. We've seen how poor or no self control can send you spinning in many different directions with no purpose, or guidance. But we've also seen and developed ways to re-align your life with what matters most: Feeling confident of who you are. The past 20 years has allowed us to help individuals draw out their own inner wisdom, heal themselves, and create personal goal setting and time management programs designed to guide you towards setting goals and using time to your best advantage. We've also learned that a big part of regaining control of your life is being able to have the support when you need it. So to help with the ongoing challenge of self discipline, we offer you daily inspirational email support with each program! Learn multiple healing processes so you become more whole and rid life's road blocks. Define and achieve your success plan with our 'Revealing and Healing' programs and our personal goal setting tools and workbooks and daily reminders! Accomplish what's really important. Maintain your motivation and inspiration. Establish a strong unbreakable foundation. Develop self control and self discipline and self wisdom on your journey to wholeness.. Begin to create the life of your dreams and have more self wisdom, awareness and control. Know Yourself (Who Am I?) Online Workbook - To the degree that you KNOW yourself you will HEAL and GROW yourself. It is the foundation of any journey - knowing where you are starting from. It is the base for a life plan towards wholeness, authenticity and being the real you. What is your life lesson that continually challenges you? Self Healing (Block Busting) Online Workbook - Master a 7 step spiritual approach to healing life's deepest problems and building self esteem. Become conscious of and release the unconscious programs and fears that bring pain. Attain new levels of self-acceptance, emotional responsibility and personal responsibility. And receive 4 weeks of daily inspirational support emails. 6 tools to make sure you are healing the right issue. 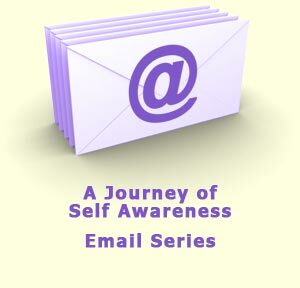 A Journey of Self Awareness Email Series - Awaken to new dimensions of who you are! This inspirational email series will help you go beyond your self-imposed limits to access more choice and freedom. Some of the topics covered include breathing, senses, fear, motives, projections, intuition, trust and communication. A total of 30 emails, 5/week. Time Management Skills Online Workbook - STOP and be aware of how you are using the time of your life. Discover the power of awareness to see what is behind your procrastination, busyness and perfection. Personal Goal Setting Online Workbook - Set meaningful goals, make better use of your time, stay on track and get more done more easily. Accomplish what's most important. Stay organized and focused. Tracking your Success and Growth Online Workbook- Stay on top of what is important in your life. Attain ongoing clarity, focus, meaning and results with 11 tracking tools and 30 days of inspirational support emails. 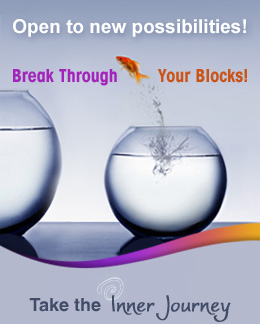 Revealing Subconscious Programs - Identify blocks, self-sabotage and limiting patterns on one page. Awareness - Gain a deeper sense of challenges and opportunities on one page. Setting Goals - Clarify what you want in life on one page. Be SMART Goals - Create Specific, Measurable, Active, Rewarding, Timely, Beneficial goals. Time Management - Get a bird's eye view of how you manage time. Identify chaos, procrastination, time wasters and what it important on one page. Tracking Insights - Capture insights and what is important to you daily. Get Self Control - Experience the power of awareness with one smart question and inspirational tip per day. Clarify your goals and manage your minutes. Stay on top of what is important to you. Become more effective and efficient. Spark your motivation. Overcome procrastination. Tame Emotions - Break through what holds you back. Become more conscious of the unconscious programs that cause pain. Reduce resistance, anxiety, stress and worry. Attain new levels of self-acceptance and personal responsibility as you connect with your authentic self. Explore your healing over 90 days with daily smart questions and tips. Feeling Finder - Add more dimensions to your feeling nature. Stream of Consciousness - Awaken your awareness at new levels. 5 Wise Whys - How to go deeper to find the truth and cause. Radar Trap - Catch yourself in the act. Enhance your awareness and self control. Smart Goals Samples - Create more results in your life. Defense Mechanisms - How do you protect yourself? Depression Causes And Triggers - What triggers your states of sadness? Ego is - How does your ego control you? Excuses and Justifiers - How do you justify your own limitations? Life Challenges - What specifically is holding you back? Limiting Beliefs - What thoughts hold you back? Losing Energy - What zaps your energy? Stress Sources - What brings you the most stress? Stress Test - How stressed are you? Victim Statements - How do you sabotage yourself? Intentions - When you stop and think, what is your intention? Sensory Stimulus - How many sensory inputs do you use? Social Influences - Do you think or are you being thought? Goals - Explore new perspectives to set meaningful goals. Surrender - Let go and let in and experience life touching you! BE SMART With Setting Goals - To really nail down your goals, here's a great way to format them. Re-Treat Yourself - Commit to some R&R - Relaxation and Review. Turn Problems into Power and Potential! - Stuff comes up for a reason. Experiencing challenges? - Learn why you're attracting them! How Are You Sabotaging Yourself? - How do you undermine your integrity and commitments? Healing the Past with the 4 E's - Heal the past by working with your imagination in the present. Are You Conscious or Unconscious? - Learn how to Stop and Pay Attention. The Void: Where The Change Process Stops Us - Mind fog is part of the growth.